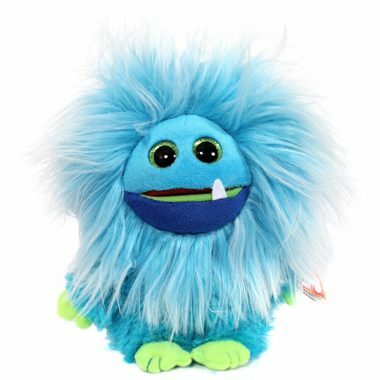 Fang is made from a fuzzy blue material with longer fur around his face. He has large sparkly green and black button eyes and lime green hands and feet. He has a single white pointy tooth on his lower jaw. If you turn Fang upside down and shake him, his hair stands on end. and let’s play for a while. Fang was released on 30th December 2014. His birthday is on 19th September 2014. This is the larger 9″ version of Fang. He also comes in a smaller 6″ version and as a key clip.